Lochwinnoch is located in Renfrewshire/Ayrshire border about halfway between Glasgow and the coast. Lochwinnoch is about 11 miles from Paisley and about 20 miles from Glasgow. The village has a population of approximately 2,000. Visit the Lochwinnoch Community website here. 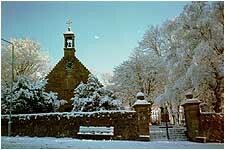 Lochwinnoch has a long and fascinating history; from having one of the earliest recorded schools in Scotland, based in the Collegiate Church which was built in 1488; to boasting of having one of the biggest most modern silk mills in Scotland when it was opened in 1814. It was one of three mills in the village which employed some 4,000 people. Lochwinnoch was once labelled the curling capital of the world with two curling stone manufacturers and furniture was produced here for some of the world's finest ships, including the Lusitania and the Queen Mary. NB. If you can't see the menu on the left of the page click here...and go to the Lochwinnoch icon. It was once one of the main stops for smugglers plying their illicit trade between the coast and Glasgow, however today it is a small village with only light industry surviving in the form of a Mineral Water manufacturer. Although it is a small village it has amenities which are the envy of some of the larger villages and towns in the area. We have a RSPB Nature Reserve, Muirshiel Country Park which includes Castle Semple Loch, a golf course, bowling green, restaurants, pubs and clubs. There are loads of activities on offer for those who enjoy the great outdoors including rowing, sailing, windsurfing, canoeing, coarse and fly fishing and cyclists can make use of the Sustrans Cycle Track. There is ample opportunity for a good walk in Muishiel Park which includes the beautiful Parkhill Woods and horse-riding is available at the local stables. But perhaps it is the people of Lochwinnoch and their varied and thriving activity groups that makes the village a good community and such and interesting place. Try www.lochwinnoch.info for more on Lochwinnoch.